We’ve all been through those phases when we are looking for different ways to prepare chicken. Generally “Greek” style roasted chicken that is flavored with lemon, garlic and oregano and stewed chicken in tomato sauce are our favorites, but sometimes we want something different. 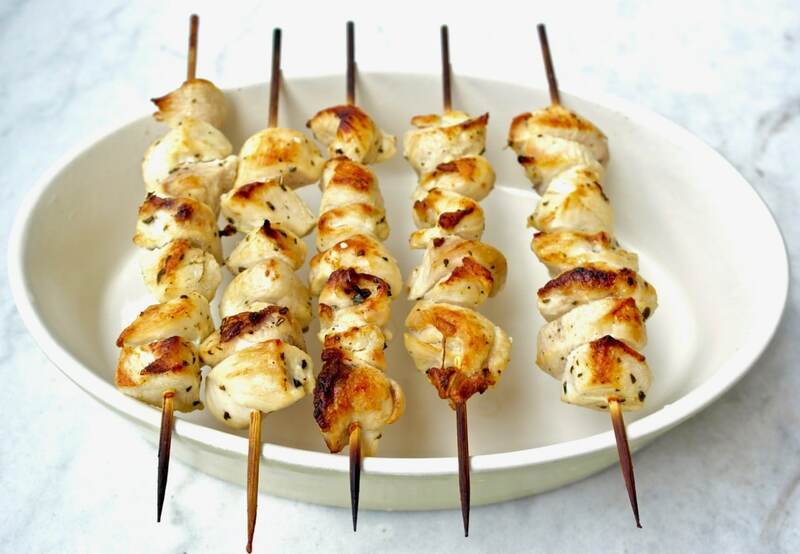 And this recipe for authentic chicken souvlaki is it! The best part is that you can roast it in the oven! That was a game changer for me, since trying this roasting method, I’ve made it several times, and the kids love them! The word “souvlaki” in Greece typically means just the meat on the skewer. The word souvla means skewer so that’s where this comes from. Nowadays it is a term that means all kinds of souvlaki but when ordering, you still need to specify what exactly you want. Souvlaki Pita: meat is removed from the skewer and served in a pita along with tzatziki, tomato and onion. Pita me Gyro: This is similar to the gyro you see in the U.S. but smaller. *And then you also have to specify if you want chicken or pork. Typically pork is the original souvlaki, chicken kind of appeared later. Contrary to what you may have read, the classic Greek souvlaki on the wooden skewer is served on it’s own, with a slice of bread and plenty of lemon squeezed over it. I still remember getting these souvlakia when we went on road trips in Greece: they would give you the souvlaki to hold, and put a slice of bread on the tip of the skewer. 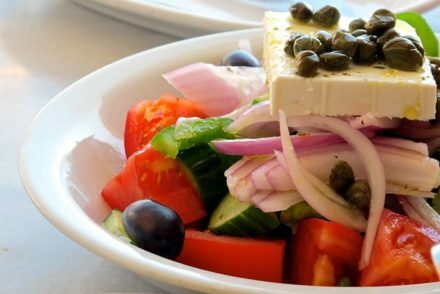 A good souvlaki kalamaki is enjoyed on its own (not in a pita or with tzatziki) because if the meat is good you don’t want to cover its flavor with sauces and pita –kind of like taking a good steak and cutting it up and putting it in a sandwich. Having said that, chicken is less flavorful than pork, so you could serve it with tzatziki or tirokafteri (spicy feta dip) or even plain Greek yogurt, but I avoid pita as I feel it is too bulky and does not allow me to enjoy the meat. So my suggestion is this: serve with some bread and a salad on the side. 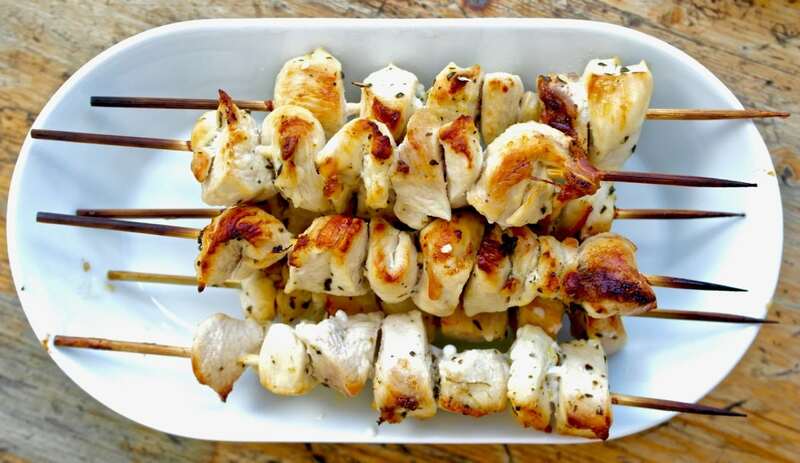 An important part of making a good chicken souvlaki is the marinade, so don’t skip that step because it imparts flavor (which is necessary for chicken) and makes the meat more tender. Don’t use big chunky pieces, they are difficult to swallow and not as tasty. In Greece souvlaki made with small pieces is prized over big bulky ones. I just want to add one more point here: if you have young children- I would pull apart each piece into smaller pieces to avoid any choking risk. You want to make sure not to over roast the meat, otherwise the result will be dry and boring. Since the pieces are small they will roast quicker. Use a meat thermometer early on to not over roast. And since we are roasting these in the oven and want to get the grilled effect, put the souvlaki under the broiler for one or two minutes. To roast the souvlaki, you will need a pan or casserole dish like the one below that is wide enough to match the length of the skewers-like the photo below- and place them one next to other and put in the oven. 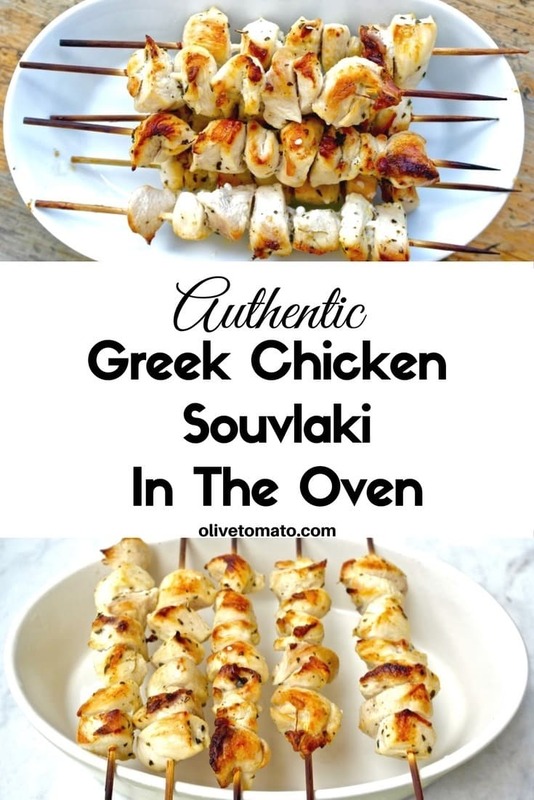 Authentic, delicious Greek chicken souvlaki at home with this easy recipe plus all the secrets for making the best souvlaki. In a plastic bag or a shallow baking dish add and mix all the other ingredients, add the chicken and mix well so that all the chicken is coated in the marinade. Cover and let it sit in the refrigerator for 2-3 hours. You can also soak the wooden skewers in water to avoid burning them (I forgot to this time). Place the souvlaki on the tray or baking dish as shown in the photo above. Roast and check the temperature at about 12 min, (it should read 165 F when ready). Once ready or about ready, place under the broiler for 1-2 minutes to get them slightly grilled. Serve hot with plenty of lemon. Thanks. I no longer eat red (aka mammalian) meat, but I do eat some chicken, as well as fish, while emphasizing vegetable and vegetarian ingredients above all. Also, I can find affordable organic chicken – organic red meat is extremely expensive here. However, I don’t see how one can use a meat thermometer on such tiny pieces of chicken. Just place the tip in the center of the piece being careful not to go through the other side. I think I remember reading somewhere that “souvlaki” was the first fast food i.e. take away food. It certainly is a street food! 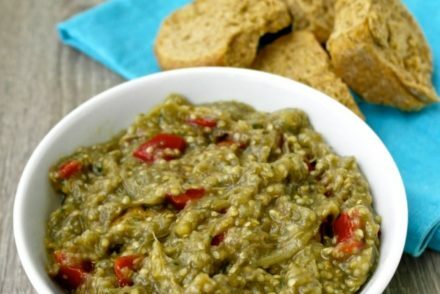 Hi Elena, would this recipe work with turkey steaks? a game changer indeed in the oven, especially when winter barbequeing doesn’t seem like too much fun, thank you for this recipe! Hi elena will this work with lamb or just chicken my kids hate chick souvlakia that’s all. Thanks please get back to me as soon as possible. This has become one of our favorite meals! It’s a hit for the whole family (grandkids, kids, parents, and grandparents). Thanks for giving us delicious, healthy recipes! Some recipes call for garlic. You don’t recommend it? As a dietician can you say if this recipe is ok for a CKD patient on dialysis? Hi Anamit, It should be fine, but I would not add salt. It is important though to speak to a dietitian to calculate amount of meat servings in the diet. This was perfect for Crete, Greece gyros!! 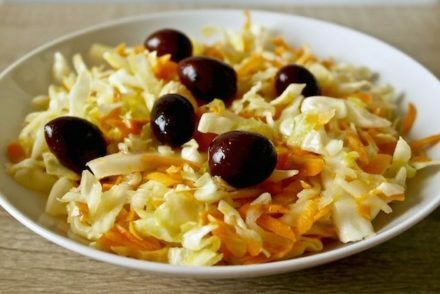 Thank you so much for such a simple and delicious recipe. Also had it with homemade saffron rice.